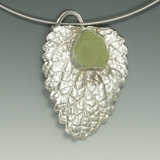 Home > "Organics IN Silver"
What started out as an experiment has turned into a glorious new collection!! When I began learning how to cast, I was trying to find natural elements that would echo the textures and colors I found in the minerals I wanted to set. I tried casting wax drops, tree bark, leaves, flower petals, mushrooms, and other assorted items. Each time I took our puppy around the block, I would collect specimens of different plants. The dog got a lot of exercise and I got a huge variety of casting fodder. Well, I had lots of fun pairing up unusual mineral specimens with veined leaves, grooved petals, and all sorts of natural textures. Soon, however, I started to fall in love with the organic castings themselves. The iris petals especially drew me with all their furls and folds. Hydrangea blossoms looked like they could come back to life. Rather than being just the vehicle to display the mineral, the organic castings became the focus of some of my pieces. I found that I could use some of my smaller stones, and even my more precious stones, as good pairings with the organics. The result of this evolution is my new collection "Organics IN Silver." This group lets nature speak by capturing the beauty of its organic creations -- primarily flowers and leaves. The original "Organic Silver" and "Organic Gold" lines let nature speak by having the forms and textures of the metal be driven by their physical properties and how they respond to the environment at the time they were melted. All three let nature speak by showcasing amazing mineral specimens in their natural state. (Funny aside: My nine-year old son was worried that I would get in trouble for picking up leaves and petals from the sidewalk and that someone would stop me and ask what was in the plastic bag I was carrying. I explained to him that when you are walking a dog no one wants to know what is in the little blue plastic bag you are carrying :-). How do we turn flowers into jewelry? NEW! Detailed description with lots of photos to illustrate how I cast organic materials. For those of you who want to know details see Casting Organics in 13 Simple Steps.